Maverick Dance Company presents Dance/Space, directed by Amanda Jackson in collaboration with Jim Bader. Dance/Space is an interdisciplinary dance work premiering at the UTA Planetarium on November 9 and 10. 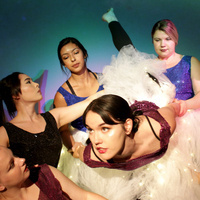 The performance features UTA dance students Yesenia Barrera, Marissa Bateman, Niki Davis, Emily Finley, Kacie Le, Megan Medina, Natalie Thomas and live musician, Brittany Padilla. Performances are held on Friday, November 9, at 8 p.m. and Saturday, November 10, at 4:30 p.m. and 8 p.m. at The Planetarium at UTA, 700 Planetarium Place.